The White House indicated Tuesday that President Barack Obama will sign into law a Pentagon spending bill that significantly raises the base budget of the US war machine while prohibiting the shutdown of the prison camp at the Guantanamo Bay Naval Station in Cuba or the transfer of its detainees to US facilities. The National Defense Authorization Act (NDAA) provides for a base Pentagon budget (excluding expenditures on active military operations in Iraq, Afghanistan and Syria) of $548 billion, larger than any year since the end of the Cold War. On top of the base budget, the funding bill includes $50.9 billion for “overseas contingency operations,” that will pay for ongoing military interventions in Afghanistan, Iraq, Syria and elsewhere, down from $64.2 billion in the last fiscal year. Together with a few smaller increments, this brings the total in military spending to $607 billion for the fiscal year that began October 1. Over the past 15 years, the base Pentagon budget has risen by 42.7 percent, growing steadily as Obama replaced Bush, the Iraq war was wound down and then restarted, and the Afghanistan war was escalated and then scaled back. The White House indicated that Obama would approve the legislation. “I would expect that you would see the president sign the NDAA when it comes to his desk,” White House spokesman Josh Earnest told a news briefing. The fiscal year 2016 military budget sent to the White House was passed by the US Senate in an overwhelming 91-3 vote on Tuesday, following the passage of a similar bill by the House of Representatives last week by a margin of 370-58, allowing Republican congressional leaders to claim clear bipartisan support for keeping Washington’s infamous offshore detention camp open. Last month, Obama vetoed an earlier incarnation of the bill, citing budgetary considerations as his first concern, insufficient reforms to military procurement his second and the ban on Guantanamo’s shutdown only third. The Republican leadership had attempted to keep in place spending caps imposed in a 2011 budget-cutting measure known as the sequester, while still raising the Pentagon’s real budget by shifting increased appropriations into an overseas contingency operations (OCO) slush fund used to pay for ongoing American military interventions abroad. Under a two-year budget deal worked out between the White House and the Congress, the caps were raised on both areas of spending, allowing for an increase in the Pentagon’s base budget of nearly 7.7 percent, raising it from $496 billion to $548 billion in fiscal year 2016. The increase in military spending is being driven overwhelmingly by the procurement of new weapons systems aimed at preparing for war against another major power; in the first instance, Russia and China. The budget provides $5.7 billion for the Air Force to buy another 44 F-35 Joint Strike Fighters from Lockheed Martin, continuing the most expensive arms acquisition program in US history. The Navy is moving ahead with a program to build 12 new nuclear missile-firing submarines at the cost of $6 billion each. The overall plan for building battle force ships presented by the Navy calls for the spending of over a third more in the next 30 years than was spent in the last 30, with estimated annual costs at over $20 billion. The Pentagon budget also includes nearly $11 billion for the military’s Joint Special Operations Command, comprising some 71,000 commandos deployed in some 80 countries. To augment the reach of these killer squads, the budget includes funding for the purchase of a new generation of Reaper armed drone aircraft used in “targeted killings,” i.e., assassinations. Significantly, the Pentagon funding bill includes provisions that shift substantial control over weapons programs and acquisitions from the secretary of defense to the uniformed chiefs of the armed services, further eroding civilian control over the military. The rise in the Pentagon’s budget is being initiated under conditions in which US military spending is already nearly three times as much as China’s and more than seven times as much Russia’s. In 2015, Washington spent more on its military than the next seven countries—five of them US allies—combined. The only explanation for such a build-up is that US imperialism is preparing for a major escalation of military aggression on a world scale. 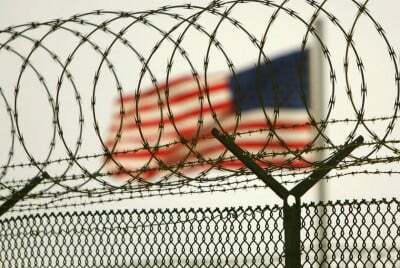 This eruption of US militarism goes hand-in-hand with the assault on basic democratic principles and rights, making the provisions to maintain the Guantanamo prison camp a logical corollary to the Pentagon legislation. Much has been made in the media about Obama confronting a challenge to his “legacy” in failing to remove the Guantanamo provisions from the spending bill. On his first full day in office, the Democratic president announced an executive order promising to close down the prison camp within one year. This will be the sixth Pentagon budget in a row that he has signed precluding such a shutdown. The restrictions were first put in place by a Democratic-controlled House and Senate. The latest legislation not only bans the transfer of prisoners to the US, but also prohibits their being sent to third countries, including Libya, Syria, Yemen and Somalia. Approaching the end of his second term, Obama has yet to present any plan to Congress for closing Guantanamo, and there is speculation that he could issue an executive order claiming the power as “commander in chief” to determine the fate of the detainees without congressional approval. Given that Obama has submitted to congressional restrictions for the past seven years, it is questionable whether the courts would uphold such an order. Federal courts recently blocked his executive order limiting deportations of undocumented immigrants. Moreover, it is highly unlikely that Obama would do anything regarding Guantanamo in the run-up to the November 2016 election. There are still 112 detainees held in Guantanamo’s cells. Over 800 men have been incarcerated in the prison camp since it opened in 2001 as an offshore facility where those abducted by the US military and intelligence agencies could be arbitrarily held without charges or trials and subjected to interrogation under torture. Only ten of those currently held are facing criminal charges before military commissions. The other 102 have never been charged, while some have been held for 13 years. Of them, 53 have been cleared for release for the last five years, most of them Yemenis, but they remain imprisoned even though Washington admits they pose no security threat. Among the others are the so-called “forever prisoners,” whom the US cannot bring to trial in any civilian court because the alleged evidence against them was gained through torture and other illegal methods. Obama’s proposal is to transfer these prisoners to a US maximum security prison, effectively a “Guantanamo North.” Alternative sites have been indicated in Leavenworth, Kansas, Colorado and elsewhere. Obama’s claims that such a transfer would somehow be consistent with American “values” are utterly hypocritical. In reality, it would have the effect of further institutionalizing an illegal system of arbitrary imprisonment on US soil, setting the precedent for the indefinite detention of American citizens as well.